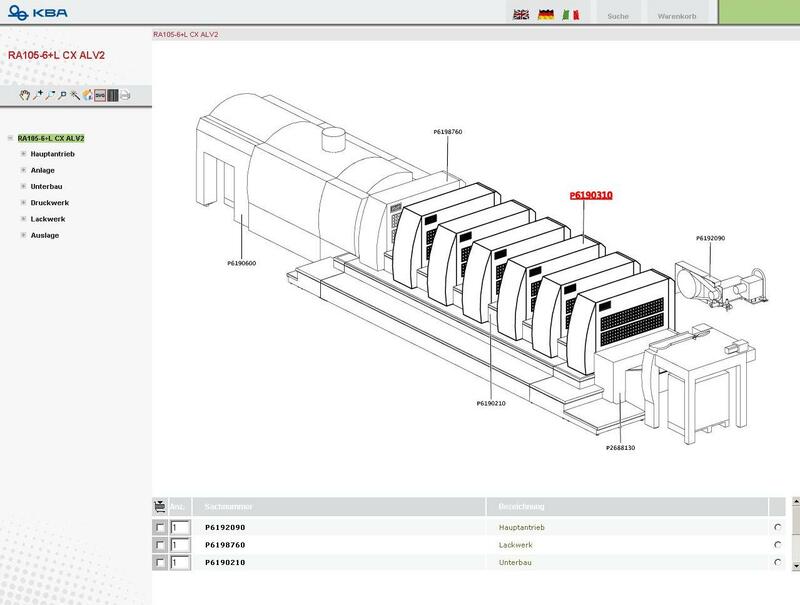 agency and customer get a spare parts catalog specially produced for each machine configuration that is generated with the software CATALOGcreator®. The company group Koenig & Bauer is with the widest product range of the branch one of the biggest printing machine manufacturers of the world. Parent company is the 1817 founded Koenig & Bauer AG (KBA). Today a global network of agencies cares for the worldwide sale of KBA printing machines. About 7800 employees of the KBA group generated a turnover of more than 1400 Mio. Euro a year in 2006. KBA is one of the biggest printing machine manufacturers of the world. With the middle format machine Rapidia 105, that produces up to 18000 sheets per hour, KBA sets new standards in the branch. KBA produces besides standard printing machines, special machines, too individually to customers desire. Spare parts catalogs exists only for the corresponding model series. To meet the increasing customer requirements, a specific spare parts documentation should be delivered in the future. Up to now KBA delivered the spare parts catalogs for the printing machines in paper form and as PDF document to the agencies and customers. With the drawing program Isodraw the necessary corrections were made to the 2D graphics and the catalog layout was designed afterwards with PageMaker. This process gets more and more complex. „The most important arguments for the introduction of a spare parts catalog software was the need to create the workflow in the spare parts management more efficient and to provide our customers the best possible service in spare parts management,“ explains Tim Hellwig, project engineer at KBA. For all model configurations of the printing machines own catalogs should be delivered in the future on CD and additionally as online version available as well. An intensive selection process should filter out the spare parts catalog software best appropriate for the company. Therefore KBA invited from the middle of 2004 by and by different vendors and carried out in each case intensive tests with the software products. By the end of 2005 the choice was made for the software for electronic product and spare parts catalogs CATALOGcreator®. In the future a special spare parts catalog on CD-ROM and for the internet is created for each individually produced printing machine at Koenig & Bauer with the spare parts catalog software CATALOGcreator®. After internal optimizing of the upstream processes we began in 2006 with the introduction of the new software. All in all only a few company specific changes were necessary in the spare parts catalog program, that KBA is able to use simply the permanent development of the standard software CATALOGcreator®. The generated catalogs can be exported directly as PDF document and/or as static HTML format for the CD and online catalog. An update of the catalogs is possible all the time. In the beginning of 2007 KBA began at the location Radebeul with the first electronic created catalog prototype for one of the common printing machine models. The local project engineers are already testing the new CD-catalog. Afterwards the first web based catalog will be included in the test phase. The electronic catalog is generated directly from a database, where all graphics and parts lists are centrally managed. The software CATALOGcreator® brings together the individual data and links the article numbers of the parts lists with the item numbers in the graphics. Up to now KBA delivered the spare parts catalog as print version and PDF document for each product series to the agencies and customers. With the spare parts catalog software CATALOGcreator® for each individually configured printing machine model an individual „intelligent“ catalog should be offered in the future. Many useful features as for example the graphical navigation, hotspots and shopping cart function are available then on CD and in the internet. The needed spare parts can be identified easy and reliable in the catalog and can be ordered through the local agencies. This entry was posted in Aktuelles @en, Latest @en, Machine and plant engineering, Maschinen- und Anlagebau @en, News. Bookmark the permalink.